The surprisingly upbeat remarks, delivered to the parliament's economics committee, saw financial markets back away from predictions of further interest rate cuts and pushed up the dollar. "There aren't indications of recovery yet. That would be a bit soon," Mr Stevens said. "But I would expect that after just a little while that households who are in a reasonable financial situation will want to borrow more, and we will see that flow through into the housing sector. "Loan approvals are already climbing. I think they will continue climbing and that will have an impact later in the year — not yet — on demand for construction of new dwellings. Personally I am sick of the recessionary gloom but even worse, I am sick of the asinine idea that government spending can fix it. Ideas like the taxpayer funding four day working-weeks that return the same income; that in an emergency somehow central planning and greater forced wealth redistribution will produce economic growth when it has the opposite effect the rest of the time. Unemployment is still at only 4.6 percent. In the early nineties it peaked at almost 11 percent. The UK, and Australian rates went even higher. I returned to NZ at this time and it was tough. Unemployed for the longest period of my working life, even had to go on the dole for a short period. But life went on and things improved. The government is only going to make matters worse if it fails to heed basic advice. Get government spending down, substantially. Get tax down and compliance costs down. Make it possible for the private sector to ride it out. An opinion piece from The Times about dementia and the urgent need to look at voluntary euthanasia as an option for early-stage sufferers raises an interesting point. More than a million of us will have dementia by 2025, two thirds of us women. The proportion of people affected doubles for every five years longer that you live, and we are now increasingly likely to lose our marbles before something else kills us. As the medical community becomes better at preventing and curing cancers, as they did earlier with preventing and curing infections, life expectancy pushes out and dementia becomes more widespread. Personally I would rather go from a physical incurable condition than lose my mind. For all concerned. The comments are worth a read as well. I haven't done a count but most appear supportive of the right to die, and many, of the right to be assisted to. "A hot day on Taupo"
Just taking this off to the framer to enter into an exhibition called "Bringing the outside in". It's a pastel sketch from some photos I took on a recent Taupo trip. Growing teenage birth rate - rebellion in action? The proportion of girls aged 15 to 19 having babies rose for the sixth year in a row, from a low of 2.6 per cent in 2002 to 3.1 per cent in 2007 and 3.3 per cent last year, Statistics NZ said yesterday. The agency's principal demographer, Mansoor Khawaja, said young women appeared to be refusing to follow their mothers' decisions to have few children later in life. "I reckon they just didn't agree with their mothers, which is not uncommon," he said. "If you look at the previous generations, the mothers of the baby-boomers had roughly four children on average. The baby-boomers [born between 1945 and 1965] have ended up with less than two children each. "There might have been a generation gap between the mother and the daughter. It's very interesting that every generation reverses the pattern of their mothers. They go back to their grandmothers." I think this is completely wrong. Most of the 15-19 year-olds having babies live in the poorest areas. The teenage birthrate in the poorest decile is around ten times higher than in the richest. These girls very often follow in their mother's footsteps. It is part and parcel of the environment of disadvantage and disregard for education. The above comments take no account of socio-economic differences and attitudes. It assumes uniformity amongst fertile females. Also the Maori teenage birth rate is much higher and accounts for nearly half of all these births. Yet the comments virtually ignore this aspect of teenage birth. Many of today's 15 to 19 year-old Maori females were born when Maori unemployment was very high and they consequently grew up on welfare. I would be very surprised if they were the first-borns of 'older' mothers who then counselled their daughters to similarly delay childbirth. Very. It certainly isn't an unusual occurrence to learn that someone who committed a crime requiring physical strength and dexterity, was on a sickness or invalid benefit. This prison census shows that 386 sentenced inmates had been on one of these benefits before incarceration. Mr Hughes knows that he cannot legally deny an individual a benefit. ( Would that he could). But she could be reclassified as 'unemployed'. That would reduce her weekly 'pay' however, to which her response may very well be to go for a better paying 'job'. A domestic purposes beneficiary perhaps. She's only 43 after all. Having a baby now would just about see her through to Super. And that's assuming she doesn't already have other dependent children. All bluff and bluster I'm afraid. The application of emphasis removes any misapprehension on the part of the reader. 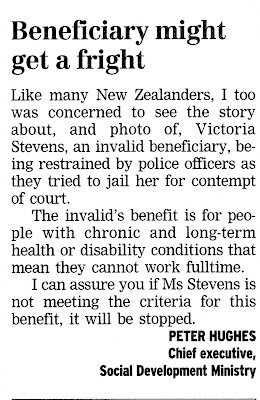 "I can assure you that if Ms Stevens is not meeting the criteria for THIS benefit, it will be stopped." Secondly the letter from WINZ (under Labour the use of the term 'WINZ' was banished but Annette King seems happy to use it) does not instruct a beneficiary to go to a loan shark. It is a reiteration of what a client told their case manager they could do to improve their situation. Paula Bennett's reaction to this letter in parliament yesterday was ... interesting. She visibly winced, acquiesced and then told the opposition that she did not expect to be agreeing with them so soon into her term as Minister. She should simply have said she would look into the matter. Poor old MSD. What they have to put up with. And if all the political posturing isn't enough have a look here. This guy has really got it in for them. Really. ... The local priest chimed in with additional stupid comments. “Whatever their ages, I say well done for bringing the child into the world,” said Father Seamus. No worries says the good reverend: “I expect social services will help and I would hope that they have got family and friends to help both of them.” No contraception, no abortion, no wonder the Catholic priest is thrilled. After all social services, i.e., the taxpayer, is there to support the child. “The hype around escalating serious youth offending and alleged public concerns about unsafe communities is not supported by data. The figures have stayed quite steady for the past 10 years." Judge Becroft said one thing that was known was that violence, especially severe violence, was escalating. "Twelve-year-olds, many of whom are committing quite heavy crimes, need to be more accountable than the present system is able to make them," he said. Cindy Kiro has diminished the integrity of the role of Children's Commissioner. Yes, she is charged with speaking for children and youth and protecting their rights. But not at the cost of the truth. And in case you are wondering, between 2002 and 2007, the number of convictions for violent offences rose by 29% and the number of convictions for traffic offences rose by 28%. I can't be bothered analysing it but I do like visual representations. Pictures are much easier to carry around in one's head. What is it with the ever growing tendency towards appealing court decisions? They didn't used to be so commonplace. What changed? Is it legal aid? Lazy lawyers? Criminals addicted to seeing their name in print? Do you want to pay for this guy to be re-tried? I sure as hell don't. Surely too, appeals use up resources contributing to unacceptable waiting times for initial trials. Appealing seems to be par for the course these days and is fast turning into a farce. [Obama's] success in piloting a $785 billion (£546 billion) stimulus package through Congress was being overshadowed by warnings that an unprecedented increase in welfare spending would undermine two decades of bipartisan attempts to reduce dependency on government handouts. Robert Rector, a prominent welfare researcher who was one of the architects of Clinton's 1996 reform bill, warned last week that Obama’s stimulus plan was a “welfare spendathon” that would amount to the largest one-year increase in government handouts in American history. The welfare reform of 1996 replaced the old Aid to Families with Dependent Children (AFDC) with a new program named Temporary Assistance to Needy Families (TANF). The key to welfare reform's reduction in dependency was the change in the funding structure of AFDC. Under the old AFDC program, states were given more federal funds if their welfare caseloads were increased, and funds were cut whenever the state caseload fell. This structure created a strong incentive for states to swell the welfare rolls. Prior to reform, one child in seven was receiving AFDC benefits. When welfare reform replaced the old AFDC system with TANF, this perverse financial incentive to increase dependence was eliminated. Each state was given a flat funding level that did not vary whether the state increased or decreased its caseload. In addition, states were given the goal of reducing welfare dependence (or at least of requiring welfare recipients to prepare for employment). The House and Senate stimulus bills will overturn the fiscal foundation of welfare reform and restore an AFDC-style funding system. For the first time since 1996, the federal government would begin paying states bonuses to increase their welfare caseloads. Indeed, the new welfare system created by the stimulus bills is actually worse than the old AFDC program because it rewards the states more heavily to increase their caseloads. Under the stimulus bills, the federal government will pay 80 percent of cost for each new family that a state enrolls in welfare; this matching rate is far higher than it was under AFDC. It is clear that--in both the House and Senate stimulus bills--the original goal of helping families move to employment and self-sufficiency and off long-term dependence on government assistance has instead been replaced with the perverse incentive of adding more families to the welfare rolls. The House bill provides $4 billion per year to reward states to increase their TANF caseloads; the Senate bill follows the same policy but allocates less money. In effect the gatekeepers have been given permission to ease up. Rector goes on to say that yes, extra money may be needed for those unemployed but that contingent already existed. This is like making more money readily available to anyone who wants to go on the DPB, which as we know, is often resorted to for reasons other than unemployment. Is there another sponsor for Peter Brown's bill? In between mowing two lawns I must break to comment on NZ First Deputy Leader Peter Brown's resignation. Why? Because he was the sponsor of the Death With Dignity Bill. It was still in the ballot. The only live challenge to the status quo in respect of voluntary euthanasia. Will another party pick it up or draft similar? I very much hope so. It would be a good opportunity for ACT to reassert its traditional liberal credentials. The individual is the rightful owner of his life. Not society or God. Note those are 18-64 year-olds and there are people aged 16 and 17 also receiving sickness and invalid benefits. Last stats I had were 1,250 (combined total) at Oct 2007. They are not routinely published. Longtime benefit reform campaigner and one-time Act candidate Lindsay Mitchell said the number of 18- to 64-year-olds on invalid benefits rose at a rate of about 6 per cent a year under the Labour Government, and that doesn't include the 16- and 17-year-olds, about 2000, also drawing this benefit. I don't know where the first part of the quote comes from. It's not far off the mark though. 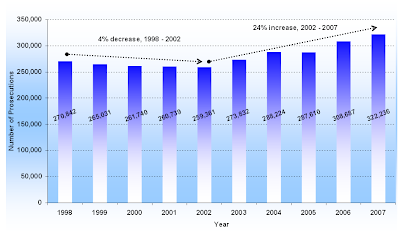 Having just worked it out, the average yearly increase between 1999 and 2008 is 5.4 percent. But the second part is incorrect. In 2007 there were 1,113 16-17 year-olds on a invalid's benefit and 137 on a sickness benefit. In a column about the invalidity of the invalid's benefit I wouldn't have mentioned the 1,113 16-17 year-olds simply because they are quite likely to be young people with intellectual disabilities and severe lifetime physical disabilities. I am happy to help journalists. I don't care if I don't get credit as long as the correct information gets out there.